I’ve touched on finding inspiration as a writer in previous blog posts before. Never before though, have I touched on certain authors that inspire me, but in the case of today’s post, I am doing just that. I have been back writing more stories for a children’s series I’ve had in development for nearly two years this week just gone. Usually before I get into lengthy periods of writing new stories for it, I tend to find myself gravitating towards a lot of the books I read growing up to get me into the right mind frame. And one author who featured the most prominently above all others in my reading choices was the one you see above. 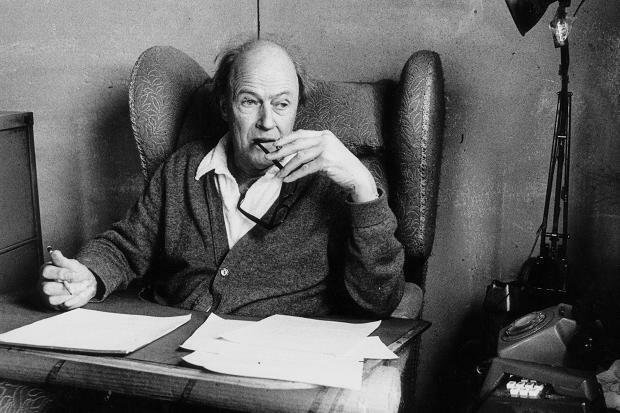 Roald Dahl was such a huge influence on me and is the person who, on the face of it, can probably be who inspired me to start writing when I was 8 years old and who gave me such a great love of books. In fact his books came along at a time in my life at school where my ability was being granted with far less justification than it deserved. Anyone of a certain age reading this blog who grew up suffering those dreadfully patronizing ‘Janet and John’ type books when you’re starting to learn to read will empathize. I often feel like it’s those sort of unexpressive, dull books which are at the root of all the reasons why English and a love of books becomes such a chore for most kids at school, and something to be avoided at all costs. 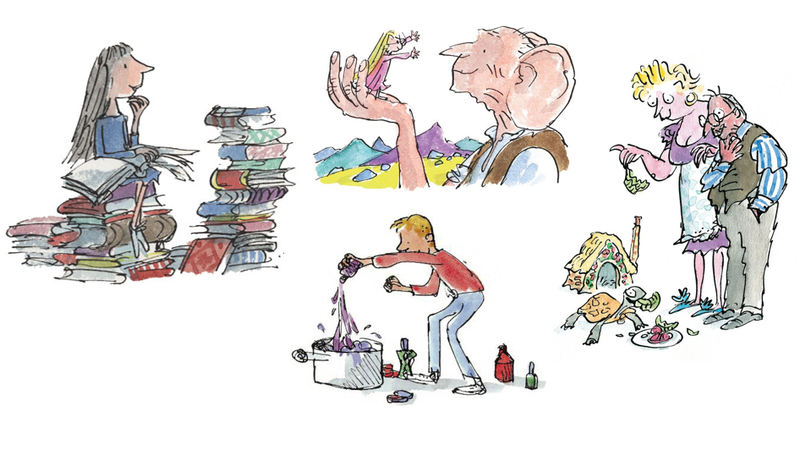 Mr Dahl was such a brutally funny, cheeky and touching breath of fresh air to me, having been introduced to them from visits to the library when I was growing up. Recent charity shop scourings have seen me pick up a couple of my old favourites of his cheaply again and rediscover a love for his use of language and character portrayal so brilliantly. So today I’m going to take you through what I believe are Roald Dahl’s finest hours as one of our most gifted, celebrated and darn right whimsical writers ever. Of course, this one has come to be defined by the 1996 film with Mara Wilson and Danny DeVito and the stage musical in the years that have passed, so it’s quite easy to forget that this one was actually a book, but it was. I identified so strongly with the neglected child genius Matilda Wormwood, and felt like her plight of being recognized for her great brain power by her odious, telly addict parents and masochistic headmistress Mrs Trunchbull was something I understood. Not that I had that issue with my own parents, thank God, but surrounded by video game obsessed classmates when I was buried deep in a book I felt that way certainly. It gave me a tremendous sense of feeling like I wasn’t alone reading this book, and I loved her kindly class tutor Miss Honey, who she eventually decides to live with when her own family go on the run from the law when her wheeler dealer car salesman father is exposed for his wrong doings. If there is one book and one book only I am intent on taking to my grave, it would be the battered old ex library copy of the very first Roald Dahl book I had read to me, by my eldest sister Helen. I loved her reading books to me when I was growing up, because she always used to have such a calming, mellifluous voice and an ability to switch in and out of voices of characters that immediately leapt into one’s head when Dahl was describing them, particularly the villainous ones, with unabashed glee and relative lack of censuring. The late Rik Mayall’s famed reading of this on Jackanory is particularly worth investigation for the same reasons. Dahl’s fantastic description of George’s cantankerous, witchy grandmother as having ‘pale brown teeth and a small puckered up mouth like a dog’s bottom’ sends me into hysterics even now, and is often the one line above all the others in the book I can recall by heart when it’s mentioned to me. It also of course, despite Mr Dahl’s own warning to avoid making his marvellous, homemade concoction myself, persuaded me to make my own medicine in the sink of my parent’s ensuite shower room. Thankfully it wasn’t ingested but I shall let you guess for yourself how that was met with their approval! I think this is probably on here as a result of the – brilliant – animated adaptation by Cosgrove Hall screened on ITV during my first Christmas in 1989, and which was subsequently rerun in the years that followed when I was old enough to watch it, with Sir David Jason voicing the Big Friendly one himself. It’s also probably on my list as a result of temporarily gaining that nickname myself when I was at school – an odd juxtaposition that I was both the tallest and youngest not just in my class but in my year. The BFG’s friendship with Sophie is really rather endearing to behold – the sort of father and daughter relationship that was so lacking in her old life stuck in a girls’ orphanage. I always used to fall into hysterics at the chapter ‘Frobscottle and Whizzpoppers’, and be gripped by their mission to inform the Queen of England about the monstrosities his blood thirsty inhabitants of Giant Country were inflicting upon the ‘human beans’ of the world. Often criticized for not having the same macabre tones as his usual work – see ‘James and the Giant Peach’ or ‘The Witches’ as a basis of comparison – ‘Esio Trot’ has always had a special place in my heart. It’s one of his shortest works admittedly – you can get the whole thing read in half an hour if you’re a quick reader – but if you’re failed to be warmed by the endearing tale of Mr Hoppy’s mission to win over his neighbour Mrs Silver via her pet tortoise Alfie then, quite simply, you have no soul. There. Said it and don’t care. The book itself is a great showcase towards some of Dahl’s work for teenagers and adult readers, which I think have been sadly forgotten about and overlooked in recent years. I have a collection of such works that he did under the compendium ‘The Great Automatic Grammatizator’ and if you can track down a copy of that second hand if you loved this book I’d highly recommend it. Again, another one which I associate with the film adapatation of, starring Robbie Coltrane, Jeremy Irons and his then 9 year old son Samuel as the title protagonist, this is again probably a lot more cosy in feel than some of Mr Dahl’s other works but this is my dad’s favourite because of its mention of Austin Chummy cars so I feel I have to put it on here if for no other reason. Regardless, this is a real page turner, and one of the few books of his (outside of his two autobiographies, ‘Boy: Tales of Childhood’ and ‘Going Solo’) written in the first person. Danny and his father’s thrilling, page gripping escapades to poach pheasants off the bloated and self important Mr Hazell’s country estate before hunting season begins reads like the same kind of exciting adventure reminiscent of ‘The Great Escape’. And again, Dahl’s wonderful use of imagery and language comes into play here. Hence why, even when I got this read again on my commute the other week, I got off the bus at half 7 in the morning suddenly craving a roast pheasant meal. Anyone who says books don’t have the power to do that sort of thing is obviously a fool. Next ›#26in26 – 26 songs from the last 26 years, chosen by you.